3 Things ETF Investors Must Know About Market Timing | Wealthy Education - Investing Strategies That Work! If you’re wondering how to invest in ETFs with the best chance of avoiding potential pitfalls, there are several things you should know about Exchange Traded Funds and market timing. ETFs offer huge opportunities for portfolio diversity, but they must be handled with care when it comes to making profitable buying and selling decisions. While stock market timing can be difficult for any investor to master, ETFs have their own set of challenges that require your ongoing attention and objective decision making, in order to maximize their potential as a successful investment vehicle. 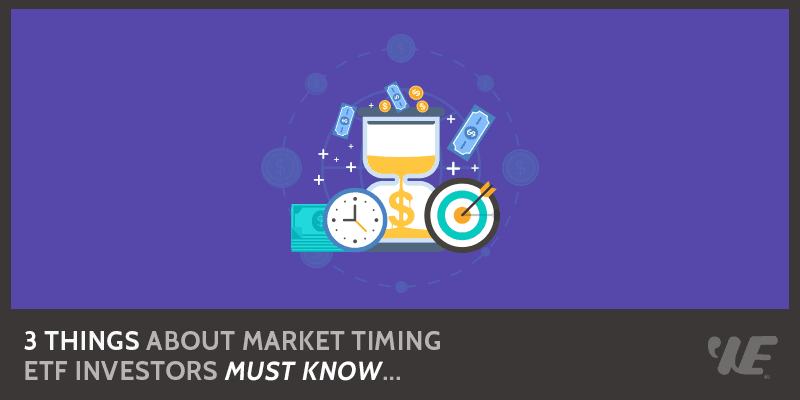 Market timing is all about knowing the most advantageous times to both buy and sell your investments, regardless of their category. Like any investor who uses active management techniques to try and increase returns, if you trade in ETFs, you need to be aware of the effects of market rotational forces. Generally speaking, correlated groups of market sectors have a natural tendency to rotate through periods of increased buying until they become overbought. At this point, those particular sectors will be sold off, prices will drop, and buying interest will move into the next group of related sectors. If you build your portfolio with too few ETFs, or with too narrow a market sector focus, you run the risk of being adversely affected by this market rotation process during those periods when the sectors representing your baskets of funds drop in price. To limit this inherent downside of your investment exposure, you should take the time to thoroughly study ETFs of interest before you buy them. Begin by evaluating such funds in terms of their relative performance strengths and weaknesses over a period of weekly or monthly cycles. If you determine that a particular ETF is favorable for your investment goals, the timing of your purchase should then be based on where that fund is currently sitting with regard to its market rotation status. If the ETF is oversold, you should wait until selling pressure has eased before making your bid. If it’s been overbought, it’s important to allow a buffer zone of weeks or even months after a price correction before you invest, to allow sellers to take their profits, and for prices to stabilize. There are many unavoidable factors that can affect your investment gains, even when your portfolio is based on the ETF advantages of diversification and targeted market sector exposure. One of these is known as correlation, and involves those periods of time when a wide range of securities will respond to activity within various bond and currency markets. Quite often, funds will move downwards rather unexpectedly and in tandem during these periods, ignoring their own fundamental make-up and performance patterns. This situation can be rather disheartening when a sound and reliable ETF in your portfolio suddenly takes a turn for the worse in response to some negative event in a country that should have nothing to do with your investment. And unfortunately, correlation is not a factor that will balance itself out over the long-term, since it only occurs in a downward direction. The best way to avoid the unpredictable and disruptive timing of correlation is to offset your exposure and protect your ETF returns through hedging. Instead of trying to stay on top of what’s happening with your ETF holdings on a daily basis during periods of high correlation, you can simply purchase put options that will allow you to sell your asset at a specific price on or before a certain date. By implementing a strangle play, in which you also buy the corresponding right to buy shares of your ETF at a specific price on or before the same date as your put option, you can further minimize your risk during times of volatile market correlation activity. It’s important to remember that, whether it’s ETFs or any other investment vehicle, emotions and investing don’t mix. Making poor timing decisions based on your own emotional reactions to current market activities, or on the advice and opinions of others, is a recipe for portfolio disaster. Decisions regarding the best times to buy and sell ETFs should always be based on an understanding of the forces affecting the market’s movement at any given time, and on how well your ETFs are responding to those forces in terms of their specific benchmarks. It’s crucial that you understand the ownership risks associated with a given investment before you buy it, instead of relying on others to decide whether or not they think it’s a good idea. One of the key elements in effectively navigating the ups and downs of market timing is to come to your own well-informed conclusions about whether or not a particular ETF makes sense for you. In many, if not most cases, investment professionals who promote a particular security are biased to some extent, and often stand to gain personally from encouraging its sale. This situation does not lend itself to an objective analysis. The best way to profit from the ETF holdings flowing in and out of your portfolio is to take emotion and questionable advice out of your timing decisions, and allow your investments to perform in the way you expected them to when you purchased them. This does not mean you should simply ignore them, or fail to monitor their performance, because that path is all too likely to lead to unsubstantiated and reactionary buying and selling. Even if you’re invested for the long-term, staying informed, keeping a level head, and regularly following the performance of your ETFs, especially during periods of high market volatility, will allow you to take objective action at the appropriate times. Stock market timing is an ongoing challenge for every investor, but factors affecting the movement of ETFs in particular can sometimes seem unrelated to what your research analysis has led you to expect. Because of this added level of unpredictability, it’s important to always approach ETF investing from the strategic vantage point of pre-planning and careful timing that steers clear of emotional and reactionary decision making.